​CLICK HERE for special ad rates! Click here to view the 2019/2020 online Directory! The Vibrational Energy Natural Health & Wellness Directory contains advertisements so you can find Natural Health, Healing,Wellness & Holistic Practitioners, Businesses, Services & Products from Windsor to Chatham and everywhere in between.. It also contains a selected number of editorials (submitted by advertisers) that will offer awareness and education to benefit to everyone. Our aim is to bring you closer to Natural Health, Healing & Holistic Practitioners, Businesses, Services & Products with a resource that will enhance and benefit your total well being – physical, mental, emotional & spiritual. 2019/2020 Edition will be available in early April! We are pleased to announce that advertising for the 2020/2021 directory is now available. Don't hestitate & miss out on getting in the next edition! The Vibrational Energy Natural Health & Wellness Directory is a FREE publication and available in many locations from Windsor to Chatham, ON and everywhere inbetween! Please CLICK HERE for a detailed list of pick up locations. This yearly directory is a 5.5 x 8.5 glossy booklet full colour holistic & wellness resources from Windsor to Chatham and everywhere in between. The 2018-2019 print run of 9,000 copies was distributed throughout the community to Natural Health, Healing & Holistic businesses, libraries, tourist information booths & more!!! Check out our Facebook page where you can find out about the latest specials, events or offers being shared by our advertisers. Connect with us today to keep up-to-date on everything!! 1. Advertise so local people and visitors can find you! 2. Become a location where people can pick up the directory! 3. Use & share the directory to find your favorite holistic practitioner, service or product! Click Here for general Ad sizes and pricing. Every year we offer advertising opportunities for businesses, products, services and practitioners in the directory. Advertising is affordable and includes free limited graphic design. The 2019/2020 directory will be available in the community shortly. You can pick up your FREE copy from any of the advertisers, at libraries, tourist information booths, leisure centres and selected stores & restaurants within your community. We offer advertising opportunities at an affordable price that includes basic graphic design availability - so we can help create an advert that reflects you and your business. The directory also has a selected number of editorials as part of the advertising package. This offers the reader the opportunity to learn more about different therapies, services and products that are available to them. The price is inclusive of being included in the online flip version as well as year long use of our Facebook page to advertise events, specials or other interesting information about your information over and above the advert in the directory. 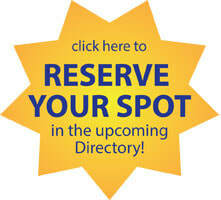 The directory offers up to 3 classifications your advertisement is listed under in the index. So, for example, if you are a store that also has a café & you offer Holistic services, by listing under three different categories people will be able to find you!! Contact us today at VibHolisticDirectory(at) @gmail.com and reserve your space for the 2019-2020 edition! !